Compliance can’t happen without training. And success in business can’t happen without a workforce educated in industry regulations, internal policy, safety, ethics, and employment law. With over 220 online courses covering the compliance topics critical to your business, Compli’s training solutions protect your organization now while ensuring your success for years to come. All of our courses are 100% online, so your employees can learn on an independent basis and grasp important information quicker than traditional in-person training means allow. Plus, reduced travel expense and less time away from the job mean significant cost savings. Let’s face it: people tend to forget what they’ve learned. As the graph demonstrates, over the course of a month, employees may retain less than 20% of what they learned at the beginning of the month. Online compliance training curbs our human tendency to forget. Compli’s Training solutions send recurring reminders and quick refreshers to employees who have completed courses, so critical information about safety, ethics, and legal requirements stays top of mind. Our platform also gives administrators tools to easily measure and track learners’ progress and overall retention. Check out a sample of our most popular compliance training titles. 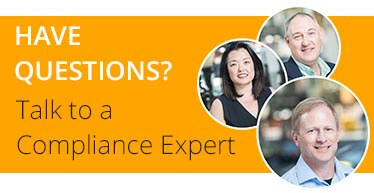 Our compliance experts would be happy to help you choose the titles that will best protect your organization. Provides an overview of accident investigation and reporting procedures. The content in this course is designed to comply with the intent of the applicable regulatory requirements. For dealership employees who need to know the what, when, how, and why of providing adverse action notices. This notice is also called a Notice of Credit Denial. Provide you with a basic understanding of bloodborne pathogens, common modes of transmission, methods of prevention, and what to do if an exposure occurs. This course seeks to help employees understand the circumstances that can trigger violence in the workplace and to offer strategies for preventing the escalation of conflict. Este curso proporciona las técnicas de conducción defensiva simples para reducir las posibilidades de involucrarse en un accidente automovilístico. Este curso ayuda a los participantes a identificar dos tipos de acoso sexual y a reconocer los comportamientos que pueden considerarse acoso sexual en el lugar de trabajo. Intended for anyone who works at an automobile dealership selling or leasing vehicles. It’s broken into several lessons to help you navigate deals fair and square. Designed to give commercial vehicle drivers an understanding of the key defensive driving concepts and provide tips and guidelines to prepare drivers for challenges on the road. Examines the DOT's security requirements relative to the shipment and transportation of hazardous materials. Designed to provide the basic information needed to recognize and report musculoskeletal disorder (MSD) signs, symptoms, and risk factors. Helps you become a qualified forklift operator. Provides forklift inspection guidelines and describes what to do in the event an equipment problem is discovered. Covers the legal requirements for protecting and properly disposing customer information at the dealership. Covers information about drum handling, compressed gas cylinders, flammable materials, slings, safe lifting techniques, and safe handling procedures. Covers the FMCSA revised HOS Order. Drivers need to be aware of the new driving rules, documentation requirements, and penalties for noncompliance. This two-hour introductory course outlines the history and mission of the Occupational Safety and Health Administration (OSHA) and why it is important to workers. Learn about the common threats to corporate computers and devices that exploit vulnerabilities in our communications and networking methods such as e-mail, Internet, and social networking platforms. The intent of this course is to provide information about control of hazardous energy and work under the protection of a Lockout/Tagout permit. Covers the federal requirement for dealerships to check the OFAC SDN List – a list of people and countries suspected of terrorism involvement. This course covers types, selection, maintenance, and care of personal protective equipment in the workplace. Interactive training that covers federal, state, and local statutory provisions available to victims, an explanation of confidential complaint investigation procedures, and employee rights of redress and forums for complaints. Reviews characteristics of various forms of harassment and discusses what supervisors and managers can do to discourage harassing behavior of any type in their own work groups. Provides supervisors with a general overview of the Red Flags Rule created by the Federal Trade Commission (FTC) to help prevent identity theft. Este curso proporciona información sobre el control de energía peligrosa y trabajo con la protección de un permiso de bloqueo/etiquetado. Demonstrates how to recognize and prevent slip, trip, and fall hazards, and to address the key components of ladder safety. Learn accepted best practices for protecting your own and your company's best interests while using e-mail, instant messaging, text messaging, social networking sites and blogs. Explains what employees should know about wage and hour laws and what to do when questions related to wage and hour issues arise. Designed specifically to address the sexual harassment training requirements under California, Connecticut, and Maine law, but is applicable for supervisor and manager training in all states. Because Compli’s compliance training solutions are accessible on almost any device, and hosted on our cloud-based platform, learners can access courses from anywhere. Compli’s scenario-based learning modules help learners understand laws and regulations that apply to their jobs. Our courses also feature high-level interactivity and video-based content designed to hold learners’ interest and keep them engaged. With optimized learning, you’ll reach more employees at more points in time, for a better transfer from learning to job performance. Customers with a limited budget can access training they may otherwise be unable to afford if they purchased directly from a provider using our pricing model. We develop all of our courses through partnerships with attorney subject matter experts. The team reviews and refreshes courses regularly, so when regulations change, your training is updated to reflect those changes. Many of our HR and Safety courses are available in Spanish, so you can meet the compliance requirements of your Spanish-speaking workforce and maximize rates of compliance throughout your organization.